People who know me well know that I have always kept a busy calendar–whether it was busy with work stuff or social stuff, I’ve always had stuff going on. I have always enjoyed being busy. This is one of the reasons summers are so difficult for me–I find great difficulty in doing absolutely nothing and really hate having too much free time on my hands. I fear retirement for this reason. My calendar these days is a little scary looking because I have had only a couple of free weekends so far this fall. Next weekend is the first one I will have had in a long time. This upcoming week, I’ll have two evenings free that I’m a little anxious about because I don’t even know what I’m going to do during that time. Normally I have meetings on both of those nights, and for the next week, they have both been cancelled. Perhaps I’ll go for a walk since the weather is cooling off and the chill of Fall is in the air. I could use the walk and the quiet time to meditate on how much things have changed in the short time that I’ve had my sleeve. Perhaps I can think about setting new goals for myself because I seem to have shot down the goals I set for myself initially. In our group meeting last night, one of the things I shared with our group was that I wanted to participate in physical activity so that I could complete a 5K by my next birthday in March, even if I had to walk it. Dr. A, our group leader said, “Oh you’ll do one before then, easy.” In my head I hesitated to accept that because I don’t think I’ll be physically ready to do one before then. I don’t know if I’ll be mentally ready to do one by then either. I’m having a tough time with this whole idea that I am working my way down into a body that can be more physically active and that will be more physically active. It’s a weird headspace for me to be in. I’m trying to picture myself as a more active person and it’s a tough thing for me to envision. I have been a more active person before, and I know I will be that person again, but it is so tough to see that me in my head. I don’t understand what is blocking me from seeing her. I’m trying to get in more walking each day by simply moving around my classroom more. All last school year, I would perch on my lab stool at the front of my room and teach from there. To teach standing up or even pacing back and forth was too painful and actually had me winded at times, which frustrated and embarrassed me. 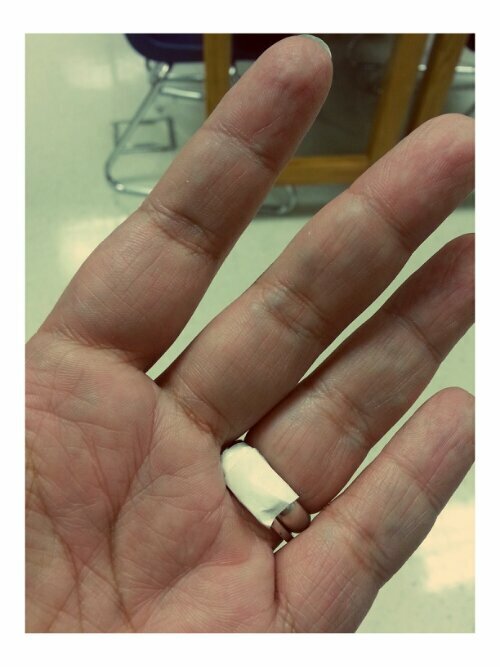 I couldn’t even stand the entire period to teach. Now, I can stand nearly the entire period, walk back and forth while talking, and teach my classes without getting tired or being in pain. I figure since I can’t get out during my planning period now to go on a walk, I might as well do it in the confines of my classroom. I’m also noticing that when I walk, my pace is so much quicker than it’s ever been. I get from Point A to Point B so much faster than I have in a long, long time. This makes me super happy and excited that I might actually finish my 1-miler that I’m doing in a couple of weeks in a good bit under 30 minutes. The one thing I need to work on right now is sleep. I’m not getting enough, and it’s not good for me. I really need about 7 hours each night to feel really good each day, and I’m simply not getting it. I’ve got to find a way to get myself to bed earlier each night. Something’s going to have to give so that I can. Eating so far is going pretty well. I’m trying to reintroduce more veggies into my eating and so far it is working out pretty well. Now I can eat green beans, corn, broccoli, cooked carrots, lettuce, water chestnuts, scallions, squash, zucchini, peppers, and onions. I haven’t tried Brussels sprouts yet, but I want to because they’re one of my favorites. Maybe I’ll pick some up at the store this week. 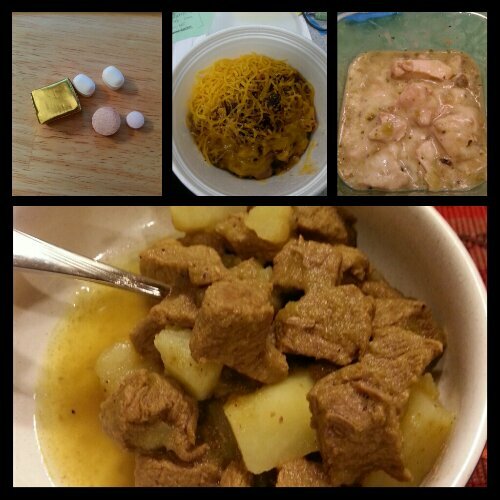 Here’s what I’ve eaten the past two days. Today was a bit calorie-heavy (a little closer to 1000 calories) but I’m not sweating it since I was under calories most of the week anyway. Protein today was good: 87 grams. Today’s food choices, from upper right: chicken in green chile tomatillo sauce with Monterey Jack cheese; homemade chile verde (my mom’s); multivitamin and calcium supplements 2x, iron supplement and B12 supplement; Rudy’s breakfast bowl with ham, bacon, beans and cheese (I wanted the fiber in the beans). Yesterday’s food choices were good as well and my protein was awesome: 99 grams. 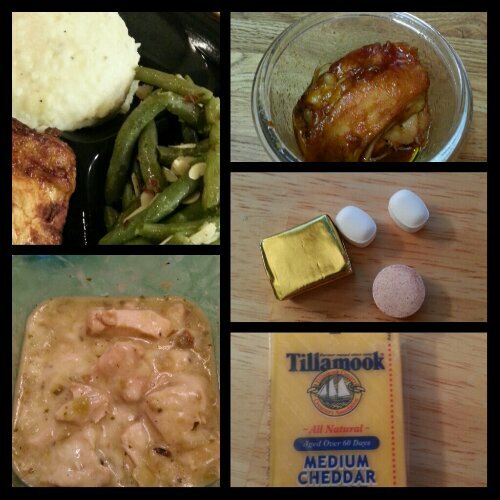 Thursday’s food choices, from upper right: barbecue boneless skinless chicken thighs; multivitamin and calcium supplements x2, iron supplement; Tillamook Tillamoo cheese snack; chicken in green chile tomatillo sauce with Monterey Jack cheese; mashed potatoes and green beans almondine. This entry was posted in daily bites, eating, post-op, vsg, weight loss surgery and tagged benefits of wls, daily bites, head trip, post-op eating, post-op life, side effects of WLS, VSG, vsg realness, what's up doc?, WLS. Bookmark the permalink. Super easy to make too! I bought this stuff called Cookwell’s Two-Step Green Chile sauce, which they sell at the grocery store we always shop at. Then I bought a pound and a half of boneless, skinless chicken breast, cut it into cubes and cooked it in a a tiny Dutch Oven that I have. After the chicken was cooked through, I poured two cups of the sauce over it and let it simmer for about an hour…I wanted the chile-tomatillo flavor to infuse into the chicken. When it was done, I weighed out 4 ounce portions of chicken and a little sauce into the containers I pack my lunch in and froze the rest. I have some weekends coming up where spending the weekend cooking will not be an option so I’ve been prepping meals way in advance lately.